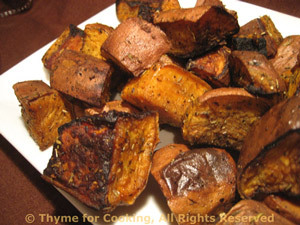 Grilled or Roasted Sweet Potatoes, simple side dish, Thyme for Cooking. Slice potatoes in half the long way, then in half the long way again. Then cut into chunks 1 - 1 1/2" (4cm) wide. Put them into an old metal pie plate or cake tin or foil barbecue container. Cook on barbecue (grill) for 30 - 35 minutes or until done... and you will need to stir them with a long-handled wooden spoon occasionally as they tend to develop 'hot spots' and can get a little crispy. Arrange potatoes on baking sheet with rim (I use my trusty, round pizza pan) Bake at 400F for 30 minutes. You can turn once if you like to fuss but I usually don't bother. Remove from oven and serve.